Last weekend I headed out to the Harrison and Chehalis Flats area to photograph Bald Eagles (Haliaeetus leucocephalus) with Seattle area photographer Steve Cole during the Fraser Valley Bald Eagle Festival. The cold temperatures had frozen a lot of the shallow waters along the Chehalis Flats area. While the flowing water in some of the channels still had some spawning salmon, much of the water was frozen. I suspect many of the dead salmon that would normally be eagle food were frozen into the ice, and as a consequence there were not nearly as many eagles as usual along the roadside where I often photograph. 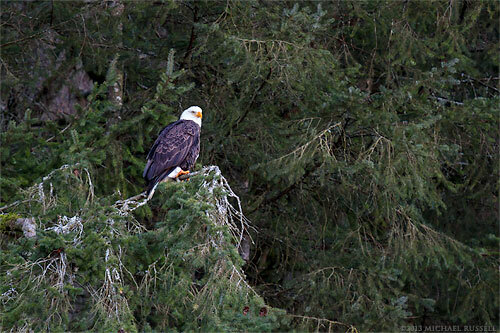 One eagle did sit on the ice eating a salmon head for a few minutes before flying away. The adult pictured above perched in this tree and remained fairly still so I was able to make some photographs. Not the opportunities that we found last year but still my second most successful trip out there.